For several centuries, mineralogy has been dealing with the occurrence, classification and description of materials that appear in nature as rocks. Recent advances in analytical techniques, such as X-ray and neutron diffraction, and computational power have enabled accurate identification of crystal structure and atomic-scale simulation of mineral behaviour. These advances have led to greater understanding of the relationships between the atomic-scale structure of minerals and their function under different environmental conditions. Modern mineralogy has opened frontiers and given inspiration to material chemists in the synthesis of new materials for clean-energy generation, environmental remediation and energy-efficiency technologies. Redox-reactive minerals are among the most attractive materials in many industries including waste minimization and recycling, reduction of atmospheric pollution, carbon sequestration and novel energy storage using materials such as electronic ceramics. Redox-reactive minerals are also abundant in nature, occurring in environments such as aquatic sediments, hydromorphic soils, sewage sludge, waterlogged peat soils, hypolimnia of stratified lakes, sediments of eutrophic rivers and seafloor hydrothermal vents, to name just a few. A molecular-level understanding of the electron-transfer reactions is the key to innovate many society-formative and clean technologies including ore processing, waste recycling and environment protection which are based on stringent control of interfacial processes. 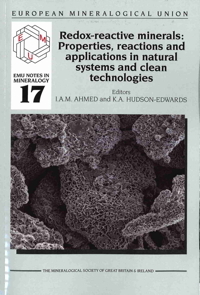 The objectives of this book are: ( l) to outline the importance and complexity of interfacial electron-transfer reactions in geoenvironments; (2) to critically review the recent developments and future trends in the identification, characterization and study of the formation and reactivity of naturally occurring, chemically or biologicaUy engineered redox-reactive minerals; and (3) to highlight key practical innovations and potential applications of redox-reactive minerals in environmental clean technologies and designing engineered remediation systems. The book also aims to serve the needs of undergraduate and postgraduate students who have groundings in the principles of geochemistry and materials science, to allow environmental scientists, chemists, engineers and material scientists to access and and utilize fields related to clean materials technology or environmental materials and allow policy makers and more specialist groups (e.g. inorganic chemists and materials R&D departments) to gain information on this topic, especially from an environmental and mineralogical perspective. The chapters of the book have been grouped under two themes. The first focuses on redox-reactive minerals in natural systems. The structure and size of iron oxides (C. Chaneac and J.P. Jolivet), spectroscopic characteristics of iron-bearing minerals (G. Klingelhofer, F. Rull, G. Venegas, F. Gazquez and J. Medina), timescales of mineral redox reactions (B. Gilbert and G.A. Waychunas), biogeocbemical redox processes of sulfide minerals (DJ. Vaughan and V.S. Coker), geochemical proxies for biogeochemical cycling and ocean anoxia (C.L. Peacock, A. Lalonde and K. Konhauser) and formation of manganese oxide minerals by bacteria (S.-W. Lee, M. Jones, J. Romano and B.M. Tebo). The succeeding seven chapters deal with clean technologies and engineered systems, namely nano-sized magnetic materials (V.S. Coker, M. Watts and J.R. Lloyd), nuclear waste disposal (C.I. Pearce K.M. Rosso, R.A.D. Pattrick and A.R. Felmy), modelling of low-temperature redox systems (I.A.M. Ahmed, P. Acero and L.F. Auque), breakdown of organic contaminants in soil (K.L. Johnson, C.M. McCann and C.E. Clarke), the recycling and remediation of mine wastes (K.A. Hudson-Edwards and D. Kossoff), porous metal-organic framework structures (T. Devic and C. Serre) and the removal of arsenic, iron, manganese and other pollutants from waters (A.A. Bogush, J.K. Kim and L.C. Campos). While this is not a comprehensive list, we hope that the examples used illustrate the complex properties and widely varying applications of redox-reactive minerals. In closing this introductory chapter, we note the significant implications of mineral crystal structure and particle size on their electrochemical properties and in determining their overall chemical and biological reactivity and function. Mineral redox reactions are complex, and studying them can be challenging, especially for those occurring at small timescales. Gilbert and Waychunas (Chapter 4) provide an excellent example of the insights gained by comparing molecular-scale and mineral redox reactions and the potential of employing ultrafast time-resolved methods in characterizing the steps and mechanisms involved in complex geochemical processes. While this book has, unintentionally, focused on iron and manganese minerals, other natmal redox-reactive minerals should be considered. Synthetic redox-reactive solids form an extensive class of materials used industrially to overcome diverse challenges in the realms of energy, health and pollution. One important example of this class of materials is the metal-organic frameworks whose structures and applications are reviewed in Chapter 13 by Devic and Serre. Redox-reactive materials have undoubtedly attracted enormous interest over the past several decades and we anticipate substantial growth in applied and basic research in this field in the future, especially in areas related to molecular-scale understanding of biogeochemical cycling and palaeoenvironmental change, mechanisms of biochemical weathering and environmental toxicology of nanoparticles. Further industrial innovations that utilize redox-reactive materials are also anticipated, particularly in addressing waste (e.g. nuclear, mining and chemical), energy and health challenges. (2017) xii + 447 pp. ISBN 978-0903056-57-1. Ahmed, I.A.M. and Hudson-Edwards, K.A. Chanéac, C. and Jolivet, J.-P.
Klingelhöfer, G., Rull, F., Venegas, G., Gázquez, F. and Medina, J.
Gilbert, B. and Waychunas, G.A. Vaughan, D.J. and Coker, V.S. Peacock, C.L., Lalonde, A. and Konhauser, K.
Lee, S.-W., Jones, M., Romano, J., Tebo, B.M. Coker, V.S., Watts, M. and Lloyd, J.R.
Pearce, C.I., Rosso, K.M., Pattrick, R.A.D. and Felmy, A.R. Ahmed, I.A.M., Acero, P. and Auqué, L.F.
Johnson, K.L., McCann, C.M. and Clarke, C.E. Hudson-Edwards, K.A. and Kossoff, D.
Devic, T. and Serre, C.
Bogush, A.A., Kim, J.K. and Campos, L.C.